graphics applications. Open Inventor delivers enhanced productivity, performance, flexibility and reliability for development of your most demanding applications that require robust and evolutionary technologies to meet the highest challenges in 3D visualization. Advanced Support of OpenGL Shaders. Remote Rendering, VR Capabilities and Multi-Display. VolumeViz Extension enables interactive visualization of very large datasets. Volume rendering, slicing, iso-surface extraction and embedded 3D geometry can be combined in a single Open Inventor-developed application. ScaleViz Extension is a set of breakthrough technologies which implement rendering distribution on clusters and multi-GPU configurations along with scene and image compositing to solve the most challenging demands in visualizing very large datasets at interactive frame rates. 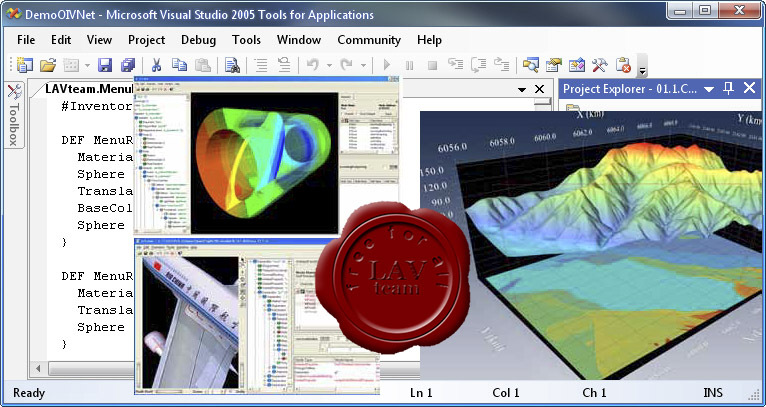 MeshViz Extension is a high-level data visualization component designed for scientific, manufacturing, finite element, fluid dynamics, and reservoir engineering visualization applications. MeshViz provides advanced representations for multidimensional data and fast, high-quality rendering techniques and supports any type of regular and unstructured 3D/2D meshes from CAE, FEA, CFD and Reservoir Engineering applications. DirectViz Extension allows Open Inventor applications to visualize 3D scenes with very high realism and scalability by using the OpenRTRT real-time ray-tracing engine as an alternative to OpenGL. HardCopy Extension allows applications to output graphics as PDF-3D documents, and in several vector formats such as CGM, HPGL, PostScript, and GDI/EMF. Data Converter Extensions provide integrated capabilities for converting various CAD/CAM file formats to Open Inventor file formats. These extensions allow developers to add sophisticated import capabilities to their existing applications.